Breweries, beaches and those epic West Coast sunsets … Yep, I had some expectations of San Diego when I moved here, but I must say I was surprised by the expansive yoga community. Two days after landing, my boyfriend and I were blown away to find an acro jam literally right under our noses on Ocean Beach as we were job hunting from a second-story restaurant. Perfect. We knew we found our new home. Upon exploring the Ocean Beach neighborhood a little bit more, I found Happy-U Namaste, a yoga studio just a few blocks from the sand. It sits next to a local craft brewery, Mike Hess Brewing, and across the street from Pirate’s Cove Tiki Port, a drive-thru and walk-up coffee and acai bowl shop. Happy-U is a fairly traditional, single-room yoga studio, advertising “no mirrors” and “no heat” on its flyers. It offers 18 classes a week, from kundalini yoga & meditation to a level 2/3 core vinyasa class. I took three 75-minute classes during my first week of unlimited yoga ($20 for new, local students). Mellow hatha is an all-levels class. I found it to be restorative and calming, with the sound of crystal bowls and gongs guiding the students through our slow movements. We focused on breath, alignment and relaxing into our poses, followed by a nice, long savasana. Yoga dance flow was a chance to leave alignment behind and certainly forget about self-consciousness for a while. We began the class with open movement, jogging, skipping, sliding and shuffling around the room, practicing our choice of twists and cat-cow movements intermittently. This yoga dance class was far from the dynamic, choreographed routine I learned in Bali, but it was a beautiful way to flow with a small group and offer various mudras as we moved to soothing music. For the strong hatha class, students set up in two lines along two of the studio’s walls so we could all face the center of the room. The focus of the class was on lengthening the side body and neutralizing the spine. Throughout the flow, we practiced chaturanga pushups, dancing warrior, bending tree pose, and, towards the end of class, forearm stands and handstands. Happy-U offers descriptions of all its classes here. The studio offers water and tea before you head into class. You can grab a mat, blocks, straps, bolsters and blankets at no charge, and there’s mat spray to use post-class. Drop-in classes are $18, but new members can take a week of unlimited classes for $20. Monthly passes are $99, with discounts for Happy-U’s workshops and special events. See more about pricing here. In addition to yoga teacher training, Happy-U schedules special events all the time. Upcoming workshops in May include acroyoga, yoga of trust, handstands and advanced adjustments for teachers. Check out the Happy-U website for current scheduled events. Happy-U Namaste is in the Ocean Beach neighborhood of San Diego. It’s a quick walk from the beach and Robb Field. For a detailed map and directions, click here. Bali won me over, but after spending two weeks there in January with my boyfriend, we decided to head east for Lombok beaches and diving in the Gilis. We managed to take a few yoga classes in that part of the country – one at Ashtari on Lombok and two at H2O Yoga on Gili Air – but our time over there was mostly spent in the sand or under water. Once I was back on Bali in February, this time solo, it was time to hit the mat and fall fully into the Ubud lifestyle again. While my first time there was dominated by classes at Yoga Barn, I decided to branch out during my second visit and check out Radiantly Alive, a smaller studio across town. I bought a three-class card for about $22 that I used over my four-day return trip. My first class was pilates with Acacia, a former dancer and yoga teacher from Canada whose energy and enthusiasm for movement lift up the entire room. The class reminded me somewhat of a barre workout, with small pulses within yoga poses to challenge the muscles. We moved in and out of poses quickly, doing a lot of ab work to strengthen the core. The next morning, I took Daniel’s RA vinyasa class, a class offered only a few times a week. Daniel is the founder and director of the studio and teaches the class in addition to running workshops and hosting yoga teacher trainings. He began the class by asking about our relationship with time. Is it a positive relationship or a stressful one? Is there never enough time? Are we always worried about what time it is? Ubud may be one of those places where time doesn’t matter, but for most of us, our lives are dominated by schedules and timelines. It was an interesting way to begin the class, and I find myself – a month later – still wondering about my feelings towards time. Physically, the class was dynamic and demanding. The room was crowded and sweaty, and the day’s heat was in full swing already at 9 a.m. After core work, we played around with half moon pose, practiced going deeper and opening up more, losing our balance, laughing and trying it again. This led to the final challenging pose of the class – pincha mayurasana, aka feathered peacock pose. The inversion practice began by placing our forearms on the mat, walking our feet in and raising one leg. From there, we practiced little hops, floating our standing foot up just a few inches as we put weight into or arms. With practice, those hops become higher until the full inversion is reached with both feet overhead. Daniel related learning to balance in pincha mayurasana to learning to walk on two feet. We’re afraid of falling, but bit by bit, with continual practice, we can find our balance. The body knows how to fall, he said. We recover and try again. I intended for acroyoga to be the final class of my Ubud experience, but a cancelled class meant signing up for something I never had any interest in – yoga dance. Again taught by Acacia, the class was packed with yogis who came for acro and ended up playing together in a completely different way. We began the class with a free dance – no mats to contain us – closing our eyes and moving to the beat of the music in any way we felt. Once we got a little loose and more comfortable, we started learning the 3:39 minute dance that Acacia had choreographed. Yoga dance incorporated yoga poses, like standing forward fold, seated twist, and downward facing dog, with quick dance moves. The class was full of laughter, and Acacia’s encouragement carried us through to the end of the 90-minute session. Check out the embarrassing but awesome video of a few of us practicing the choreography one last time after class, here. Radiantly Alive has one main open-air studio with a gorgeous jungle view. Drinking water is available at the front desk, and the studio is equipped with mats, blocks and straps. Anywhere from two to seven classes a day are offered, with 15 different classes throughout the week as well as yoga teacher trainings and workshops. Visit radiantlyalive.com for more info. Radiantly Alive offers just about any option to suit your stay in Ubud, from single drop-in classes at $9.50 to 180-day unlimited passes for $495 – and everything in between. The studio is conveniently located across from Bali Buda, a fantastic restaurant with a neighboring natural foods market. For detailed directions, click here. It was early January, and I had just come from a month in the Philippines with a pretty poor record of practicing yoga. Once I arrived in Ubud, a gorgeous jungle yogi paradise set on the Indonesian island of Bali, I bought a card at Yoga Barn and got excited. Yoga Barn is the perfect place for the yoga-curious. Its teachers offer beginners classes as well as classes and workshops for more advanced students who want to deepen their practice. The schedule is packed with 11-15 classes a day, each of them different, and when I was there in January, 16 different styles of yoga were on the schedule. Months ago, when Ubud was just a daydream I’d pieced together from Instagram images, one of my friends told me that her time there shook everything up – in a good way. I didn’t quite follow, but I loved that she said it, and I’ll admit that I wanted to experience some of whatever it was that shook her. So, in the two weeks I spent in Ubud, I went to seven classes at Yoga Barn: restorative, laya, vinyasa, acro (twice), kirtan, and nidra. I dug right in with a sense of experimentation and wonder. After an airport nap, over-night flight, and early morning transport from Denpasar to Ubud, my boyfriend and I sought a little therapy and relaxation with Yoga Barn’s evening restorative yoga class. It was held in the upstairs studio, an elevated hut that comes with everything one would need for the practice: mats, bolsters, blocks, straps, blankets, water, and all-natural mosquito repellant. We left the class feeling incredibly relaxed. As we noshed on sushi rolls at an open-air Japanese restaurant across the street afterward, we fell totally in love with Ubud. Our first yoga experimental class was Sunday morning laya yoga, recommended by a friend who told us to go into it free of expectations or assumptions. The three-hour class was based in kundalini and incorporated a lot of up and down movement with coordinated breath. Much of the class focused on vocal expression, releasing built-up tension, and letting sounds involuntarily move through us. As a student laughed hysterically on the other side of the room and others orgasmically moaned through poses, the teacher noted that if any of us were annoyed by the sounds of others, it was a good thing; that means it’s working. Accept it and move past it. Feeling the need to get back to basics the next day, we signed up for a good ol’ vinyasa class. The flow incorporated a 15-minute inversion practice break, which was fun for about half of the class and confusing for the rest. On a whole, though, it was just what we came for – an energetic sweat session in the afternoon Balinese heat. My next two classes were acroyoga, and I was surprised by how unique each class was. We didn’t do a single warmup or pose in the second class that we did in the first, and it was almost a completely new group of people. While both classes focused on the acrobatics component of acroyoga, the first one was much more playful. We warmed up by doing a tougher version of wheel barrel – this time with feet hooked on hips and no hands from the partner walking upright. We stacked plank on plank and did synchronized pushups. We got into teams of three for assisted handstands. The second class taught me several new poses, which was exciting and inspiring. After a much shorter warmup, we practiced flag, flying child’s pose, and moving from a easy throne to shin stand. After the second class, my boyfriend met back up for an acro jam on the patio just outside the studio. We met a few others from the class, as well as seasoned acro yogis, to practice and play. The following Sunday night took me back to The Barn for kirtan, another friend recommendation. Sitting in a semicircle facing three musicians, we closed our eyes and chanted together in Sanskrit, sharing the energy and power of a group sing-along and slowing down the tempo as the class came to a close. The 15-minute savasana at the end put me into the most relaxed state I’d experienced in quite a while, and I walked out peaceful and totally happy. My second time in Ubud, I returned for a yoga nidra class. Again, it came as a recommendation – this time from my boyfriend’s mom, who had become familiar with it during her yoga teacher training in the states. I heard how relaxing people find it and went into the midday class half expecting to take a nap. Instead, we were instructed to walk the line of total body and mind relaxation without completely succumbing to sleep. With the teacher as a guide, the intention is to do a full body scan and focus on one body part at a time. The teacher then moved onto describing a place and telling a story while we were instructed to visualize the imagery using our subconscious minds. Towards the end, I found it difficult to get out of the discomfort in my physical body (cold, laying on the floor) and get into a state of relaxation. But I don’t think I fell asleep, so at least there’s that. Even though I may have decided some of these forms of yoga aren’t for me, it’s hard to say anything bad about my time practicing at Yoga Barn. Each class opened my eyes to new people and practices, taught me something about myself, and gave me something to work on – mentally or physically. First, the restaurant: It’s really good. It’s reasonably priced (about $3-$4.50 per dish) and offers everything from pre-yoga energizing drinks and cashew nut lattes to Ayurvedic kitcheree and macrobiotic main dishes. And it’s super tasty. A juice bar – which sells drinks, popsicles, and quick treats for before or after class – is also just outside the studios. The upper studio holds 35 people, and the lower studio holds 30. FYI, they do strictly hold to that number and turn people away once a class is full. Showers (with liquid body soap) are available to use post-class, free of charge. There’s also a water cooler near both studios. Individual classes are about $9.50, but cards are the way to go if you’re planning to attend at least three. My boyfriend and I each bought the five-class card for $37. If you’re in town for a long stay and want to try it all, you can purchase a 30-day unlimited card for around $190. Yoga Barn, located at the end of a small alley in Ubud, is in walking distance from tons of hostels and guesthouses. If you’re heading south from the palace on Hanoman, the alley will be on your left. The sign, which is found at the top of a list of other destinations down the same alley, is a little difficult to spot from the main road, so also keep an eye out for Zen, and turn there. Yoga Barn hosts movies, yoga teacher trainings, workshops, and retreats. Check out www.theyogabarn.com for schedules, current prices, and directions. I found the Brahma Kumaris Meditation Center in early December of last year. I was in the middle of a solo trip around Luzon, the biggest island in the Philippines, and after a week or so of hiking volcanos and wandering museums, I felt the need to stay put in the city of Baguio for a couple days, dig a little deeper, and figure out my next steps. The Baguio center had a five-star review on TripAdvisor, but with only three reviewers, I wasn’t totally sure what to expect on my visit, other than the peaceful experience and beautiful views that had been written about. I liked going into it this way, without knowing too much. Before my visit, I wasn’t sure what kind of vibe the center would have or even what kind of meditation classes were offered, but I was crossing my fingers that I’d at least meet people there who could point me in the direction of some Baguio yoga classes. Up until then, I’d assumed anything called “yoga” had to do with the joining of movement and breath. The Brahma Kumaris Center was my first encounter with a different kind of practice – the practice of raja yoga. I showed up on a Sunday afternoon, at the end of a weekend gathering of Filipino Brahma Kumaris practitioners. The Baguio center is a gorgeous, small green space with one of the best views of the city, near the top of a hill overlooking valleys, homes, and farms. I was warmly welcomed there by everyone I met. When it became clear that I wasn’t going to find the kind of yoga I was looking for, I scheduled a Brahma Kumaris introductory class with Sister Salud, a self-described “content spirit,” for early the following Wednesday morning. The first lesson offered a detailed background of Brahma Kumaris, or BK, a worldwide learning community that practices raja yoga meditation. Literally translated, raja means king, ruler, or highest. Yoga is a union, link, or connection. Raja yoga was described to me as making a connection to a higher power. Practice self-love. We should try to achieve self-love through understanding and appreciation of the self and by doing the best we can to make ourselves happy. self-sovereignty – ruling our kingdoms by being independent and making our lives and ourselves worthy. Meditation is a tool. Use it to discover the self – to contemplate, reflect, and focus on one thing. Still the mind, and actively create a thought to focus on. Take what we want. Relegate old knowledge to the side, and go into new knowledge. There’s a lot to discover. Come to our own realizations and find our own truth. Once we find the truth, experience it and take what’s beneficial. Feed the mind with goodness. Focus on positivity and healing during meditation. Take the dirty, muddy water of our negative selves and run clear, pure water over it until it’s clean. We ended with a guided meditation, which was the raja yoga practice, and set a time to meet for the next session. The second class focused on the soul-body connection and discovering who we are spiritually. Sister Salud said the commonality of every human being is the soul – a living energy of light – within the body. We discussed the location of the soul, what some might call the third eye. The soul gives life to the whole body. The soul is like the driver of the body, which is the vehicle. The body is for expression and experience. Be soul-conscious. We should find a direction and a purpose for what we’re doing. Put the energy of our soul there and focus on the qualities of the soul. This is our energy. It’s intrinsic. Seek peace from within. If we’re aware of our soul energy, we can get support from within. Choose peace, and direct our minds to be peaceful. Drive energy into positive qualities. Remain aware of the type of soul we want to be, and manifest it. So, how do we manifest a positive living energy of light? According to Sister Salud, that’s the question to be answered through raja yoga. Again, we ended the class with a guided meditation. My time in Baguio was coming to a close, so she pointed me in the direction of other BK centers along my travel route. While I haven’t taken the time to attend a third session, I’m so thankful for my experience learning about the practice of raja yoga, and I’ve started to incorporate some of the ideas into my meditation practice. Tell the driver to go to Dominican Hill. Once you get a bit out of the city and start heading up the hill, you’ll pass Lourdes Grotto. Keep going up the hill but not quite to the top. You’ll see the sign for the Brahma Kumaris Meditation Center on the right, as you approach the top. It may be difficult to catch a cab back, but start walking down the hill, and you’ll probably get lucky with a cab, tricycle, or jeepney around the bottom of the stairs at Lourdes Grotto. Brahma Kumaris has over 8,000 centers across 130 countries, and it’s been around for 78 years. Its brochure explains: “Through meditation, we seek to help people rediscover their goodness and develop their spiritual awareness, attitude, and behavior.” For more information, visit BK on the web at www.brahmakumaris.org. 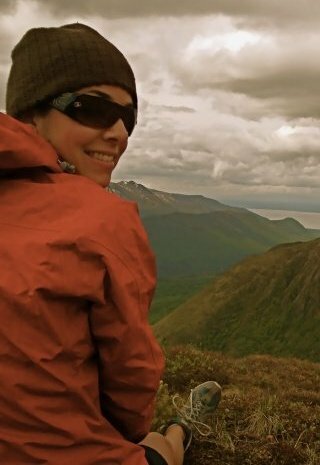 Introducing guest blogger, Amy Steele for http://www.karabemisyoga.com, welcome Amy! Hidden in an industrial area of Chiang Mai’s old city, at the end of what appears to be a deserted alley, sits The Yoga Tree, a shaded oasis of a chilled-out yoga retreat. In September, in the middle of a trip to Thailand that brought me over from South Korea and my mom from Alaska, we dropped into The Yoga Tree for a 90-minute yoga foundations class with Gernot Huber. These particular classes explore a common theme every week – with classes currently held Monday, Wednesday and Friday – each one building on the next. The Wednesday session we attended was a hands-on workshop-style class, with a focus on engaging the muscles between the shoulder blades and aligning the head and neck to improve posture. It was a small class of five people, which allowed each of us plenty of personal attention from Gernot. Gernot taught a very hands-on class, giving adjustments to us through downward-facing dogs, planks, lizard poses and inversions. In each pose, he would gently push our back muscles into correct alignment, followed by helping us align the head and neck with the spine. My mom and I agree: One of the most memorable poses was the partner exercise in L-shaped handstand, or half handstand. My mom received an adjustment from Gernot and was able to access the pose carefully, yet confidently, knowing the support was there. The Yoga Tree is a bit difficult to find if you’re not familiar with Chiang Mai. Trust me; we went up and down the west side of the old city several times until we finally asked a local how to get there. Don’t be like us; find detailed directions, in English and Thai, at their website, here. The studio is well-equipped with mats and props, including bolsters and blankets, which were essential for my mom’s titanium knees. Water bottle refills are available at the smoothie bar outside. 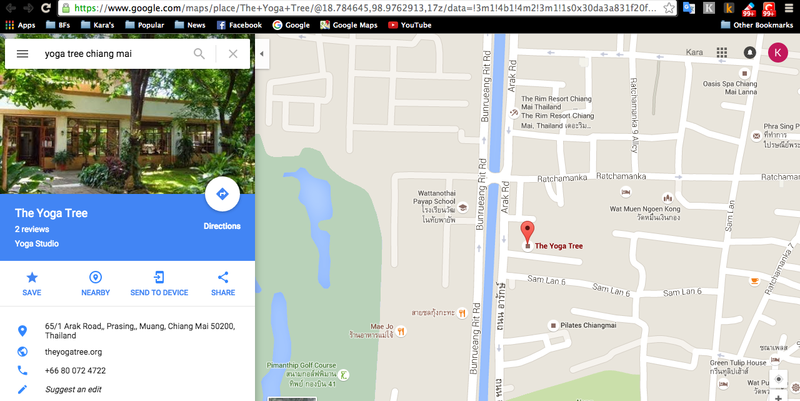 A regular 90-minute drop-in class at The Yoga Tree is 250 THB, or about 7 USD. Passes are also available. View The Yoga Tree’s class schedule here. In addition to teaching at The Yoga Tree, Gernot teaches at Wild Rose Yoga Studio and offers private classes at his studio in Chiang Mai, Yoga Mind Yoga Body. Amy Steele has been teaching English in South Korea since 2013. On the side, she volunteers as a copyeditor and occasionally writes for a local expat magazine. She hopes 2016 will bring her the good fortune of continuing her yoga practice across Southeast Asia.